The friendship between Councillor Siddiqui and I started on the campaign trail and has continued as we were both elected to serve our first terms on the Cambridge City Council. We decided to take advantage of the fact that not only were we new, but we were women, who could approach the job and engage with our constituents in new and innovative ways. We started this podcast so our listeners could get to know us, the issues, and the City in a more intimate and friendly format. 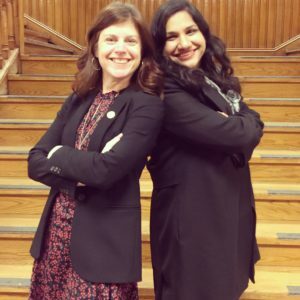 We hope that our podcast is not only a new way to keep residents informed, but will also give people a deeper understanding about what it’s like to be a female elected official, and to take this journey with us. You’ll hear from us every week, but we also host other amazing women, such as Congresswoman Katherine Clark, our highest ranking woman police officer, Superintendent Christine Elow, and our former Budget and Finance Director, Sarah Stanton.